Renault have moved against industry pricing trends by lowering the recommended retail price of the entire Laguna range to co-incide with the launch of the new Laguna Estate and petrol-powered models. “In addition to extremely high standards of safety and excellent equipment levels the Laguna range now offers even more value for money,” says Renault Managing Director, Rudi Koenig. The price of entry-level Laguna Expression Hatch (2.0 dCi, 6-speed manual) has been reduced by $4,000. Other changes include the top of the range 2.0 diesel, 6-speed automatic, Privilege Hatch and Dynamique Estate being reduced by $1,500 and $3,500 respectively. New Laguna boasts a dynamic, elegant exterior. The front end, with its streamlined optical headlights, long, sloping bonnet and generous air intake grille, are balanced by the plunging shoulder lines. On the hatch, the crease line extends along the boot, just below the rear LED sidelights, which give the car a distinctive rear profile at night. Diesel hatch variants are fitted with dual chrome-plated exhaust outlets. At 4.69 metres in length and 1.81 in width, the Laguna hatch is 36 mm wider than its predecessor, 10 mm longer and 12 mm taller. Although significantly larger and more spacious its carefully engineered body is around 15 kg lighter. Chrome highlights on the side windows of the Dynamique Estate and Privilege Hatch add an extra touch of class. Depending upon the model, new Laguna rests solidly on 16 to 18 inch alloy wheels. Practical design features include a fuel tank flap with a ‘clean hands’ integrated opening system. The elegant styling of the Laguna Estate features a steeply raked rear window, while the slightly elongated glazed area of the rear quarter light further accentuates the car’s sporty lines. Although it shares the same 2.76-metre wheel base as the hatch, the Estate’s 4.8 metre length endows it with a distinctive personality. The extended rear overhang contributes to the 501 litre luggage area in its five-seater configuration. With the split-fold rear seat lowered this number increases to 1,593 litres. New Laguna’s interior is perfectly in tune with its exterior, a refined finish, high-grade materials and quality prevail throughout. The dashboard accentuates its top-of-the-range feel, with the design and positioning of all the controls and displays ergonomically tailored to the driver’s needs. The central console includes the main controls for the cruise control (with speed limiter) and the electronic parkbrake. Enhanced cabin insulation and refined chassis and engine characteristics combine to make new Laguna one of the quietest cabins in its class. The innovative “Soft-Auto-Fast” programmed air-conditioning controls, located between the air vents, allow climate control settings to be customised to suit occupants’ tastes and needs. The “Auto” mode acts as a point of reference: it strikes an excellent balance between noise level and temperature, with an automatic control rapidly kicking in. 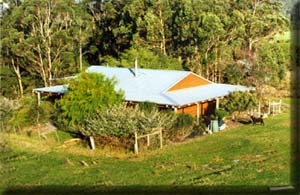 “Soft” mode produces soft and silent ambiences. The “Fast” mode produces an efficiently breezy air flow. 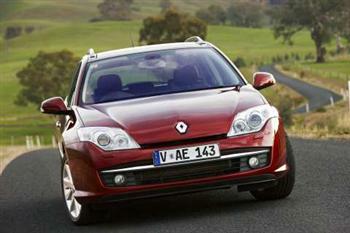 The convenient Renault card also controls the ‘see-me-home-light’ headlights. The 2.0 litre dCi engine is the heart and soul of the new Laguna and delivers outstanding performance and fuel economy. Maximum power of 110 kW is produced at 4,000 rpm and maximum torque of 340 Nm at just 2,000 rpm. Depending upon the model, the engine is matched to a six-speed manual or seamless six-speed ‘Pro-active’ automatic transmission. Given the vehicle's performance characteristics, the hatch 2.0 dCi’s combined cycle fuel consumption is extremely competitive at 6.0 litres/100 km (158 g CO2/km) for the six speed-manual, and 7.0 litres/100 km (185 g CO2/km) for the ‘Pro-active’ six-speed automatic transmission. The 2.0 dCi engine also complies with the Euro V pollutant thresholds, two years before the regulations are due to come into force. Manual diesel versions are fitted with a dash-mounted gearshift indicator, ‘Eco-Shift’, which advises the driver the best gear to select to optimise fuel consumption. The 2.0 litre petrol-powered, turbo-charged, 16-valve engine produces 125 kW of power at 5,000 rpm and 270 Nm of torque at 3,250 rpm and is matched to the ‘Pro-active’ six-speed automatic transmission. With a combined cycle fuel consumption of 8.9 litres/100 km (210 g CO2/km) is an excellent alternative to its’ diesel sibling. New Laguna is built for genuine driving pleasure. Programme engineers set extremely high standards for road-handling characteristics and vehicle dynamics resulting in a highly responsive chassis and high-precision steering. Developed to surpass the acclaimed dynamic performance of its’ predecessor, new Laguna’s chassis delivers remarkable road holding on corners. A lower steering ratio and stiffer driving column, afford new Laguna high-precision steering and enhanced driving pleasure in bends. The reduced steering ratio makes the car easier to manoeuvre and more agile. New Laguna ensures peace of mind for all its occupants. In terms of safety, it benefits from Renault’s acknowledged know-how in real-life accident research and state-of-the-art technology. In addition to achieving one of the highest scores recorded in EuroNCAP testing, the new generation side-impact sensors have the ability to deploy the side airbags in half the time of other systems. The unique twin-sensor combination is located in the front door. A special algorithm adjusts equipment response time to the strength of the impact, deploying a new-generation, twin-chamber, double-pressure side-airbag that protects the thorax and pelvis. All models feature “belt-not-fastened” LED warnings for all five seats and audio warnings at the front. Active safety features such as ESP, ABS, EBA and cruise control (with a speed-limiter function) are also standard across the range. The bi-xenon directional headlamps (standard on the Privilege Hatch) adjust according to the speed of the car and the steering wheel angle and provide up to 90% more light when cornering than halogen lamps. A tyre pressure warning system is also standard on the Dynamique Estate and Privilege Hatch. As part of an exhaustive durability programme, over 120 Laguna prototypes were put through their paces over more than 6 million kilometres in all corners of the globe. Prototypes were tested in a variety of extreme conditions throughout Europe, Argentina and Malaysia. Over 30,000 kilometres of testing were also logged in Australia. The increased emphasis on product quality and durability is reflected in the upgraded 3-Year/unlimited kilometre warranty. The Laguna hatch range now consists of an Expression and Privilege diesel-auto combination, an Expression diesel-manual model and automatic-petrol Expression and Privilege models. The Laguna Estate is an ‘auto only’ model in Expression petrol and diesel variants along with a diesel-powered Dynamique model. Eight model variants in total are available. Standard equipment on theExpression Hatch and Estate include ESP, ABS with EBD (Electronic Brake Distribution), ESP with ASR traction control, dual front and rear side airbags and curtain airbags, dusk sensing headlights and rain sensing wipers, front and rear fog lamps, “See Me Home” headlamps, Cruise control with speed limiter, automatic parking brake, leather steering wheel and gear knob, integrated rear side door sunblind, dual-zone climate control with carbon and odour filter, ‘carbon’ cloth upholstery, and a 4x30W single CD, AM/FM radio with MP3 CD reader with satellite audio controls. The remote control central locking is operated by the Renault Card system along with the ‘see me home headlights’ feature. Exterior features on the Expression hatch and estate include 16" alloy wheels, body-coloured door mirrors (heated) and door handles. In addition to the high level of Expression features the Dynamique Estate has a dark-carbon, part-leather/part-Alcantara® interior with a 4x50W dash mounted 6-CD changer, AM/FM radio with MP3 CD reader and a electrochrome rear-view mirror. Externally the Dynamique Estate is fitted with 17” alloy wheels, rear parking proximity sensors, chrome window surrounds and auto-folding door mirrors. 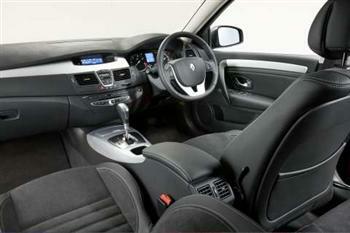 A metallic colour scheme and seats with prominent lateral supports are features of the Dynamique trim level. They blend with the leather or Alcantara® optional fabric upholstery to provide dark charcoal ambience, and the flat-section steering wheel and aluminium insert lend the ensemble an unmistakably sporty feel. Additional features (over Expression) for the Privilege Hatch interior include beige leather-trimmed upholstery with electrically adjustable heated front seats, electrochrome rear view mirror and a 4x50W dash-mounted 6 stack CD AM/FM radio with MP3 CD reader. Exterior Privilege features include rear parking proximity sensors, 18" alloy wheels, chrome window surrounds, xenon directional headlamps with headlamp washers and auto-folding mirrors. 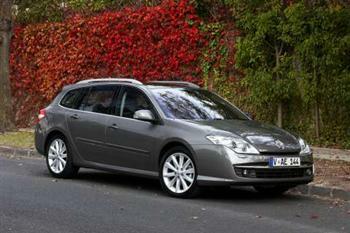 The Privilege Hatch and Dynamique Estate are both fitted with tyre pressure monitors.